"I have recently updated my lights and was alarmed to receive an IEC (Kettle) lead with a shielded Earth pin on the plug (see photo). 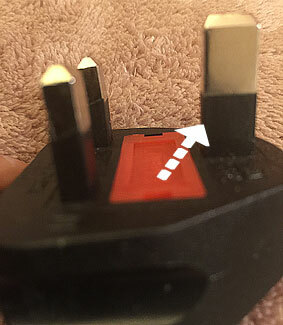 You frequently find this sort of plug on a 2 wire supply to a ‘figure 8’ connector for a Class II (double insulated) appliance. But this light was a Class I appliance which relies on being earthed via the mains cable to the building ring main. This lead failed a PAT test straight out of the sealed box. If members have an IEC lead with a shielded Earth pin it is likely that the appliance is NOT earthed during use. I would urge all members to check their kit without delay for these plugs as they could be lethal." If you are unsure about the safety of any piece of equipment then you can find a list of local PAT testers in the AMPband Members Area under 'Useful Services'.